"The vastness of Russia devours us"
Barbarossa's operational goal was rapid conquest of the European part of the Soviet Union west of a line connecting the cities of Arkhangelsk and Astrakhan, often called the A-A line. At its end in January 1942, the Red Army had repelled the Wehrmacht's strongest blow. Adolf Hitler had not achieved the expected victory, but the Soviet Union's situation remained dire. Tactically, the Germans had won some resounding victories and occupied some of the most important economic areas of the country, mainly in Ukraine. Despite these successes, the Germans were pushed back from Moscow and could never mount an offensive simultaneously along the entire strategic Soviet-German front again. Ribbentrop was frantic. He paced around the room. He kept muttering that if the Germans had not attacked first, the Russians would have attacked Germany. As if he was trying to convince himself that Hitler's decision to attack was right. But Ribbentrop resented that his pet treaty the Non-Aggression Treaty of 1939 as in tatters. May be he understood that Hitler had committed the biggest blunder od his life. The Soviet ambassador to Germany, Dekanozov was a short man. After Ribbentrop had given Hitler's message that Germany was taking "defensive measure" against Russia, the Soviet envoy rose and said, "You'll regret this insulting, provocative and thoroughly predatory attack on the Soviet Union. You'll pay dearly for it!" Ribbentrop hurried after the envoy as he left and whispered, "tell them in Moscow that I was against the attack." This pictures is interesting. It was published in a Soviet newspaper on June 20, two days before Germany attacked Russia. It shows Russian guards on the German border. The German Blitzkrieg technique was as devastating in Russia as it had been in the rest of Europe. 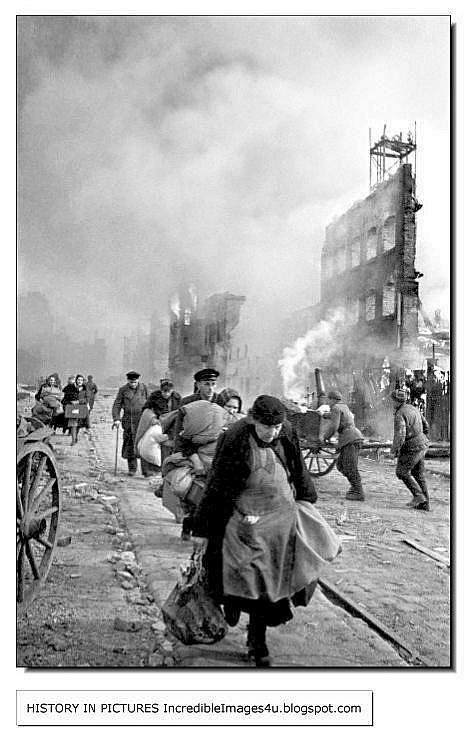 The scene was set for a war of annihilation waged by the Nazis against the Soviets with no mercy shown by either side. 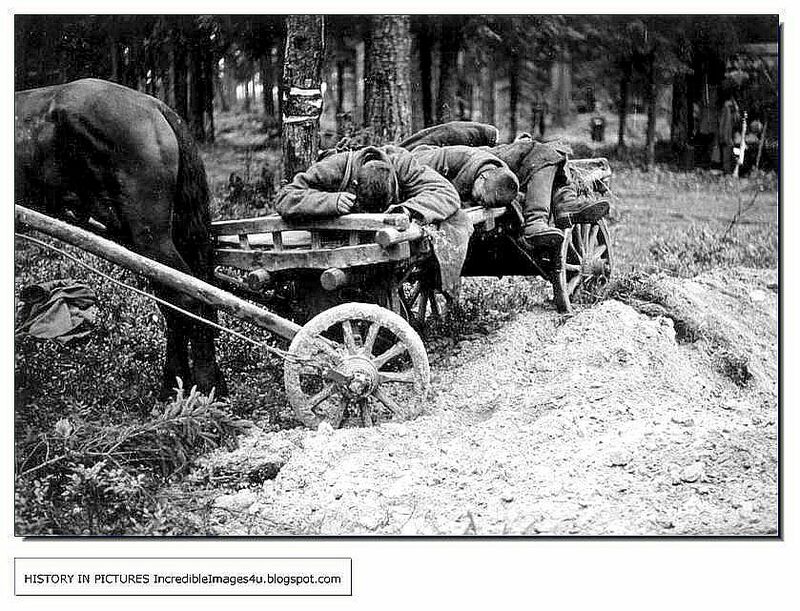 One week into the German invasion, 150,000 Soviet soldiers were either dead or wounded - more than during the five months of the Battle of the Somme. As the German armies swept further into the Russian heartland, one million Soviet troops were drafted to protect Kiev. 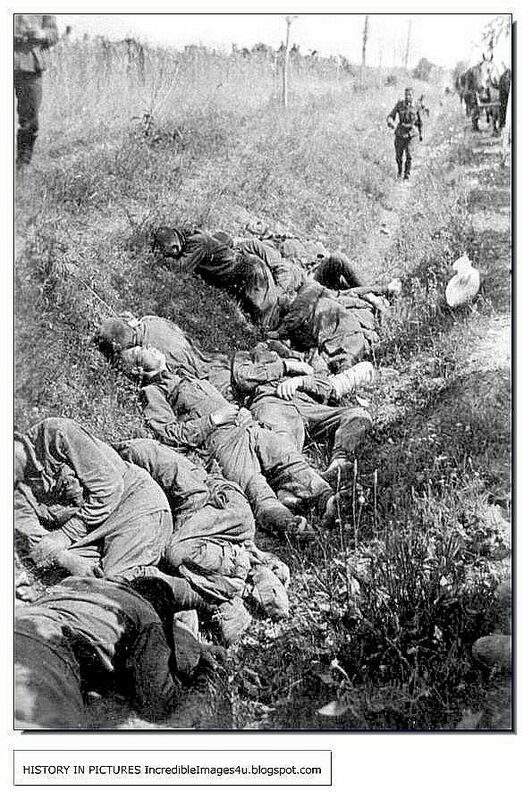 But despite Stalin's ruthless order forbidding any city to surrender, Kiev fell and 600,000 Soviet soldiers were captured. 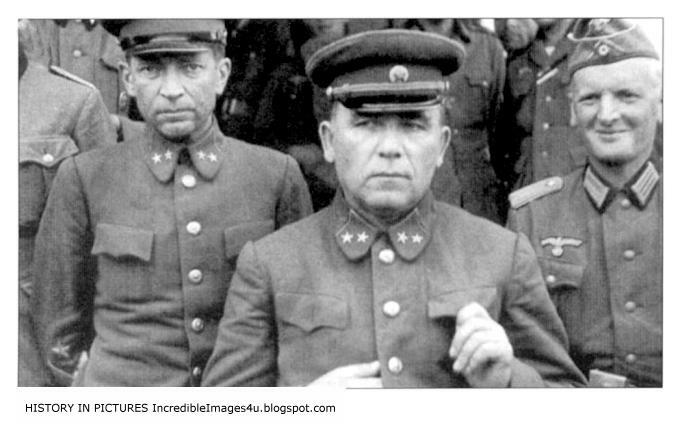 By October 1941, three million Soviet soldiers were prisoners of war. New testimony and documentary evidence can now reveal that Stalin was seriously considering suing for peace and had even organised a 'getaway' train to take him to safety as German guns started pounding Moscow. His decision to stay and fight was a crucial turning point in the war. 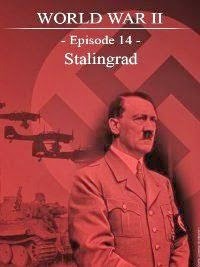 Stalin and Hitler were together responsible for the leitmotiv of ruthless brutality that prevailed throughout the hostilities between Russia and Germany. During the Battle of Moscow, in which 8,000 Soviet citizens were executed for perceived cowardice, the Russian armies were forced to stand their ground, despite perishingly cold conditions of 43 degrees below freezing. To prevent his soldiers deserting the front line around the capital, Stalin ordered special 'blocking detachments' to shoot all deserters. The Soviet leadership also instructed Soviet partisans operating in the countryside to kill anyone whom they believed was disloyal. This resulted in an effective carte blanche for partisans to abuse their power and extract whatever they wanted from helpless villagers. Soldiers had built fires in their camouflaged encampments to keep away the mosquitoes. Accordion players struck up sentimental songs. While a few sang, others stayed with their thoughts. Many dreaded crossing the frontier into the unknown land of which they had heard only terrible things. Officers had warned them that if they slept in Russian houses, they would be bitten by insects and catch diseases. Many laughed, however, at comrades who wanted to cut all their hair off as a precaution against lice. In any case, most of them believed their officers when they said that there would be no need to worry about winter quarters. In the 24th Panzer Division, for example,Captain von Rosenbach-Lepinski is said to have told his motorcycle reconnaissance battalion: 'The war with Russia will last only four weeks.' Such confidence was, in many ways, understandable. Even foreign intelligence services expected the Red Army to collapse. The Wehrmacht had assembled the largest invasion force ever seen, with 3,350 tanks, around 7,000 field guns and over 2,000 aircraft. Nazi rule over the territories they captured from Russia was draconian. Erich Koch, Reich Commissar of occupied Ukraine stated that the 'lowliest German worker is a thousand times more valuable' than the entire population of the Ukraine. 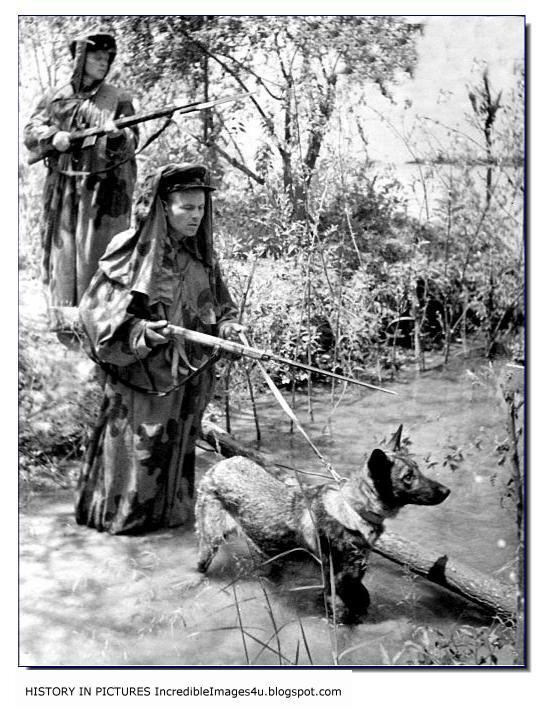 Starvation was widespread, with Soviet civilians forced to eat dogs - until the dog supply ran out and people were forced to turn to rats, crows and birch bark. In the Ukrainian town of Kharkov, which was administered by the German army, 100,000 people died of starvation and disease. The German army, faced with an ever growing partisan threat, became increasingly comprehensive in their view about what constituted a partisan. One army document lists 1,900 partisans and their 'helpers', killed by the Germans in one action. But only 30 rifles and a handful of other weapons were found with them - more than 90% of those killed by the Germans had no guns. 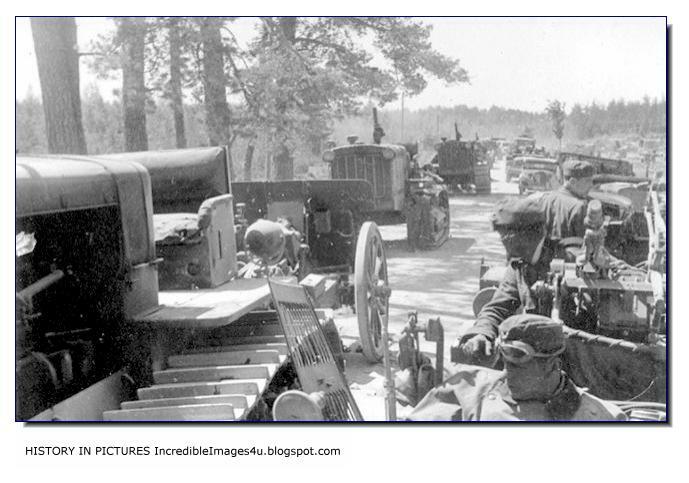 At 3.15 early morning, June 22, 1941, the German artillery started firing on the Russian border positions. Bridges were captured before the Russians could react. The Soviet border guards and their families died in the German bombardment. 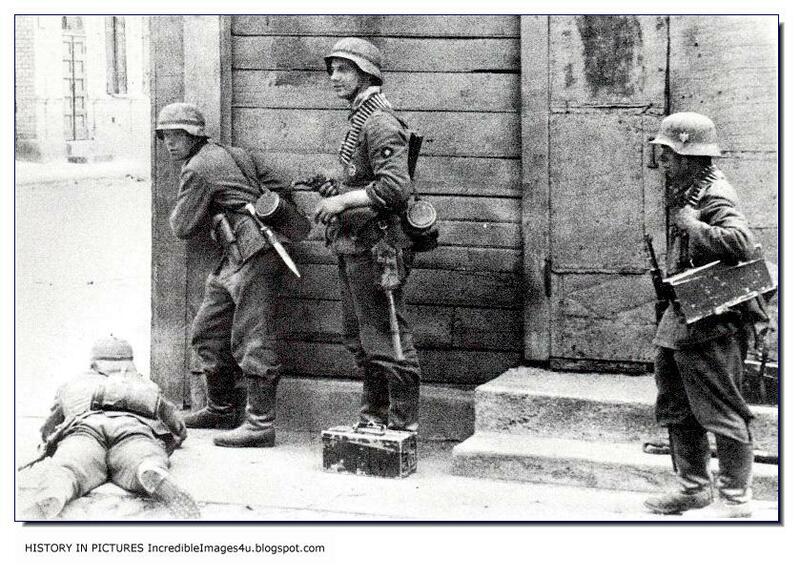 German commandos infiltrated deep into Russian territory and cut off telephone lines. Since April, 1941, anti-communist Russians and Ukrainians had crossed over with radio sets. 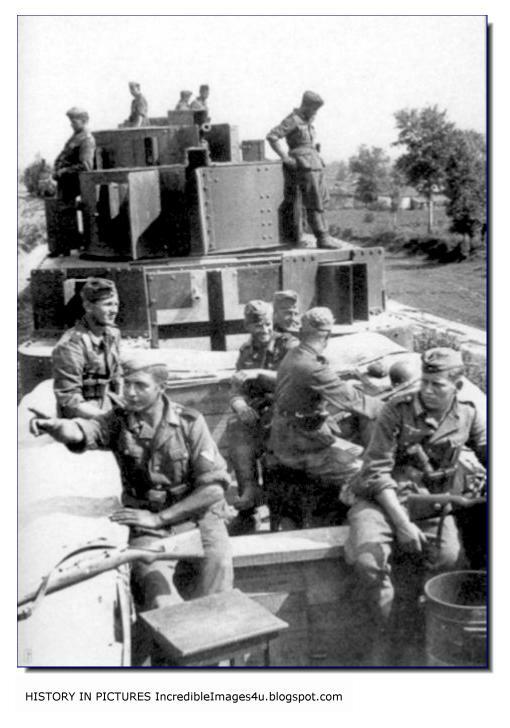 At the first light of dawn German infantrymen clambered onto assault boats (to traverse water bodies). As they moved they could hear the roar and screams of German Stukas as they went hunting for Russian targets. 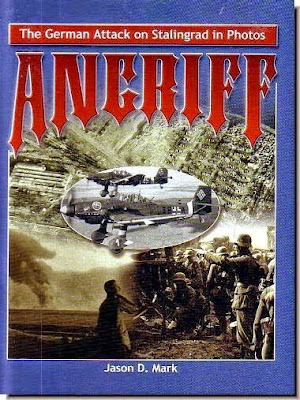 The Luftwaffe's main target was the aviation wing of the Russian army. German planes happily mowed down lines of neatly parked Soviet planes. 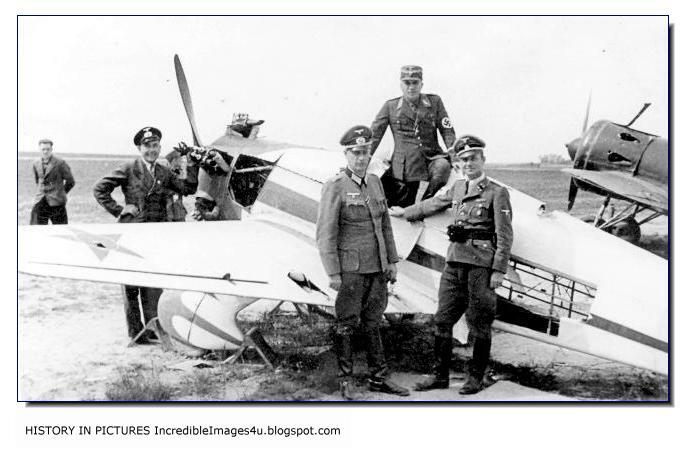 Inexperienced Russian pilots, especially from bases further inside Russia, frantically tried to engage German planes. But they were poorly trained. And their planes were obsolete. In desperation they started ramming their planes onto German planes. A Lutwaffe top officer described the skirmishes against inexperienced Russian pilots as infanticide. Actually the German armored Corps where far smaller then that of the Russians. At the start of hostilities on June 22, 1941 the following numbers for the two sides are as follows. 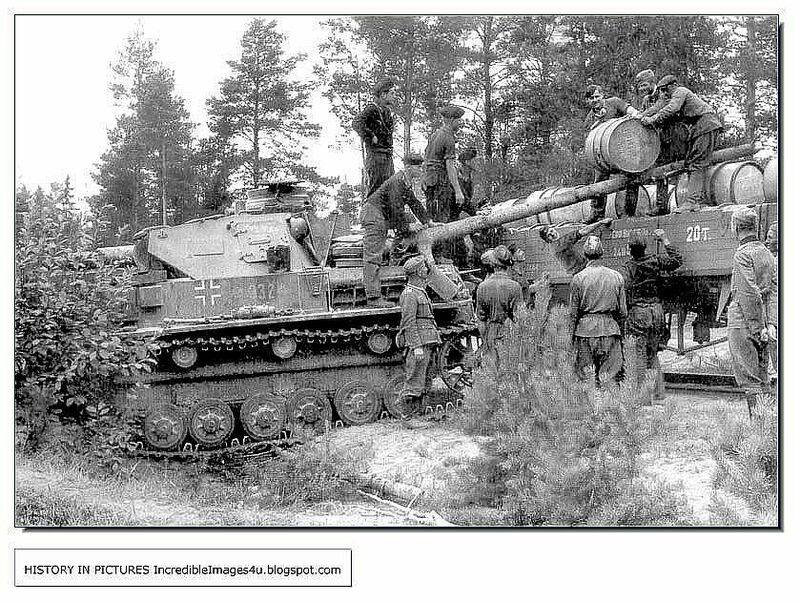 The Panzers where greatly outnumbered actually, by the Red Army. In 1941 the Soviet Union had as many aircraft and MORE tanks than the REST of the world COMBINED. 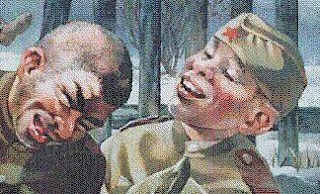 But Soviet Army were poorly trained and terribly led. A German column passes by abandoned Russian artillery. In the beginning the Russians suffered many reverses. WHY DID RUSSIANS LOSE INITIALLY? 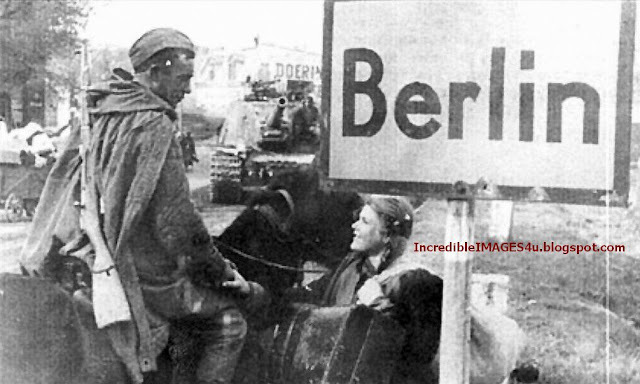 On June 22nd 1941, German forces crossed into the USSR, without a war being declared. The invasion came as a shock to Stalin. Although he had been given details about Germany's invasion plan from spy RICHARD SORGE, he did not believe in it, because spies observing a factory producing buttons for Germany's uniforms did not report a significant raise in the production of winter coat buttons. Stalin remained in a state of shock for weeks, which left the USSR whichout a commander. 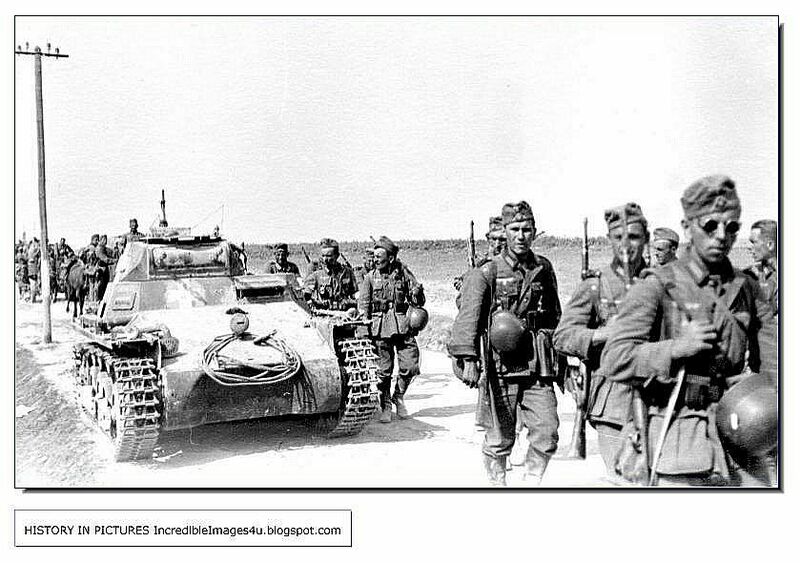 In the meantime, German panzer units quickly pushed forward, encircling Russian army units. FINLAND seized the opportunity to regain Eastern Karelia, also invaded the USSR and thus became a German ally. The Soviet army took heavy losses, and by winter 1941 the German army stood in front of Leningrad and Moscow. However, the advance came to a halt, for a number of reasons. (1) the German army, despite Hitler's long-term-goal of acquiring Lebensraum im Osten, was not prepared for a winter war. German tanks were unfit to move under severe Russian winter conditions, and the soldiers were not even supplied with winter coats. (2) Meanwhile, Stalin had recovered from his shock, and Russia had reorganized it's defence, which inflicted the German army, in front of Moscow, it's first defeat. On the road to Smolensk. A destroyed Russian truck with dead soldiers. In the background, the Germans march on. WHY DID STALIN SIGN THE NON-AGGRESSION PACT WITH GERMANY? When Stalin signed the Nazi-Soviet Non-aggression Pact, he was at a point of almost desperation. He had tried again and again to convince Britain and France to open a second front and all he had received was a few mild mannered brush-offs. So instead of a second front he got a promise from the one person he was afraid of, that Russia would not be invaded. But what Stalin failed to see was the Hitler had no intention of keeping his promise. 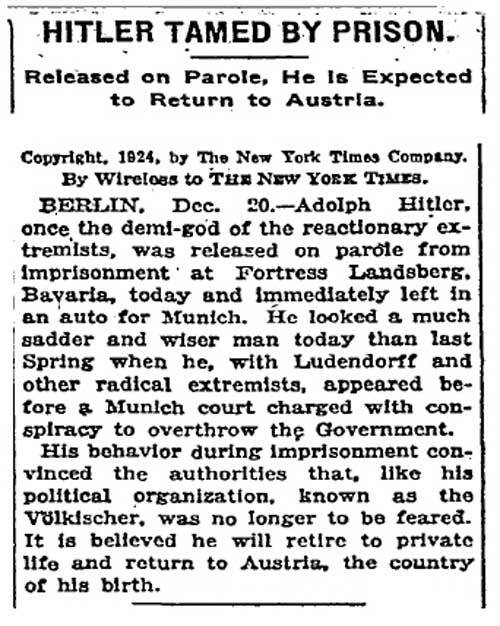 Hitler had a long record of lying, manipulation and promise breaking. 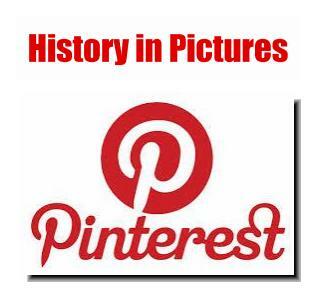 For example, in January 1934, he signed a 10-year non-aggression pact with Poland. The Germans made mincemeat of the cart and the Soviet soldier in it. * When the Soviet Union was defeated, the labour shortage in the German industry could be relieved by demobilization of many soldiers. * Ukraine would be a reliable source of agriculture. * Having the Soviet Union as a source of slave labour would vastly improve Germany's geostrategic position. * Defeat of the Soviet Union would further isolate the Allies, especially the United Kingdom. In preparation for the attack, Hitler moved 2.5 million men to the Soviet border, launched many aerial surveillance missions over Soviet territory, and stockpiled vast amounts of material inthe East. Yet the Soviets were still taken completely by surprise. This has mostly to do with Stalin's unshakeable belief that the Third Reich would not attack only two years after signing the Molotov-Ribbentrop Pact. He also was sure the Nazis would finish their war with Britain before opening a new front. Despite repeated warnings from his intelligence services, Stalin refused to give them credence, believing the information to be British misinformation designed to spark a war between the Nazis and the USSR.The German government also aided in this deception. They told Stalin that the troops were being moved to bring them out of range of British bombers. 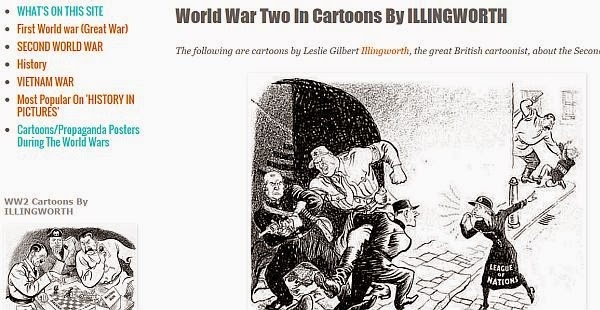 They also explained that they were trying to trick the British into thinking they were planning to attackthe Soviet Union , while in fact the troops and supplies were being stockpiled for an invasion of Britain. It has been established that communist spy Dr. Richard Sorge gave Stalin the exact launch date; also Swedish cryptanalysts led by Arne Beurling knew the date beforehand. If Hitler's plan for an invasion of the Soviet Union was to succeed he could not afford to have hostile forces operating on the southern flank in the Balkans. He initiated a campaign in the Balkans which became a success in itself but lasted longer than planned. Operation Barbarossa was originally set for May 15, 1941 but was delayed because of the extension of the Balkan campaign. The effects of this delay will appear later on when the Germans are faced with a Russian winter. Dead Russian soldiers atop a T-26 tank at a frontier post. The Germans look and pass on. Hitler's over-confidence in the campaign taking only eight to ten weeks convinced him that most of the Army would be back home long before the arrival of winter. Therefore, winter clothing was ordered for only one-fifth of the invasion force. The German soldiers were equipped with light clothing and accustomed to nothing like the bitter Russian winter. Weapons, food, and flesh froze. Still, Hitler said there would be no retreats. The Russians, however, were equipped for winter. The front-line troops held Germans at arm's length. Prevented by the Fuhrer's order from withdrawing and regrouping, German generals found it difficult to meet stiffening Russian resistance. The Nazis became sitting ducks as the Russians began their counterattack. A huge reserve of troops were being built up in the rear. On December 6, 1941, Marshal Georgi Ahukov sent the Soviet force surging forward against Germany. This sent the Germans back about 200 miles. 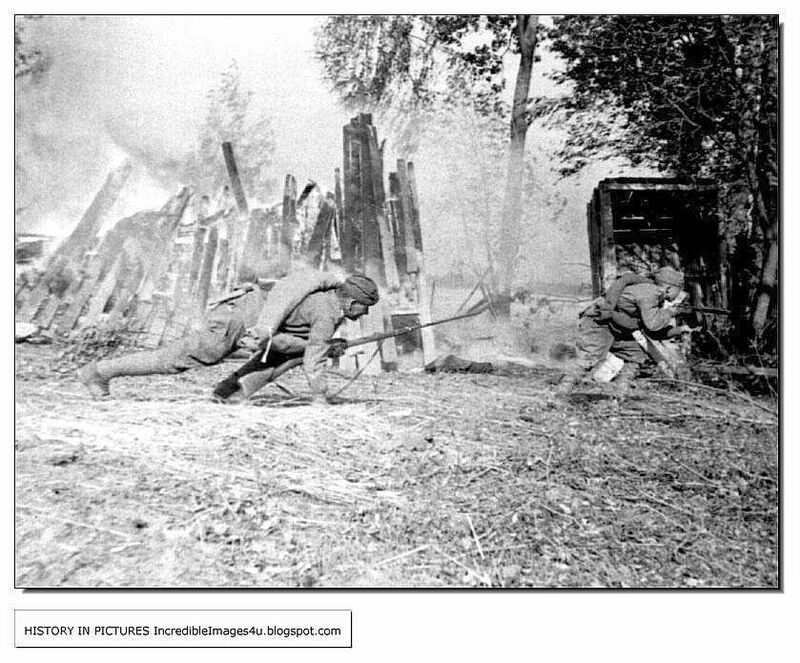 When the barrage opened on the morning of June 22, 1941, Red Army units were slow to react. Officers radioed for permission to fire back. 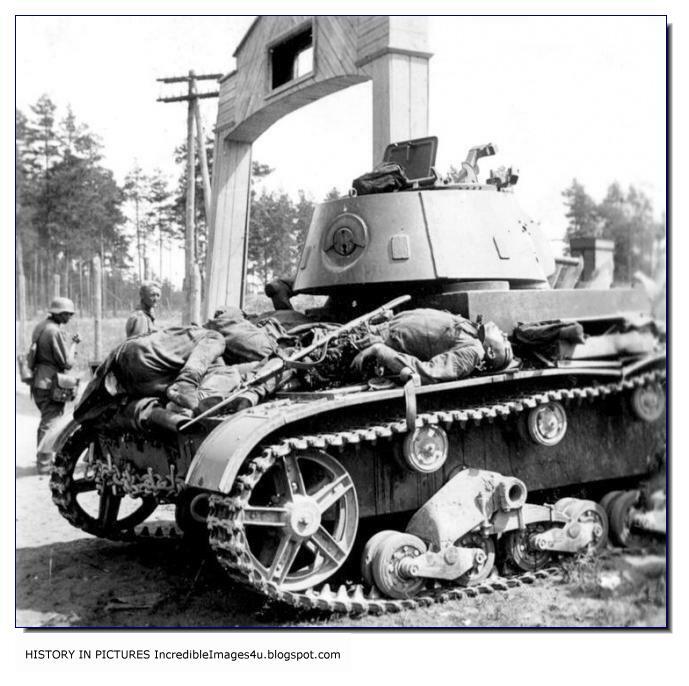 Tanks numbering in the hundreds were knocked out of action by superior tactics backed by superior morale. 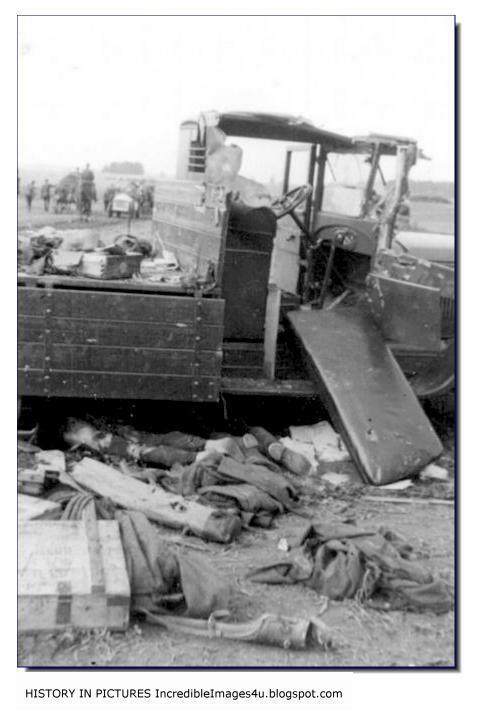 The Red Air Force was destroyed on the ground. 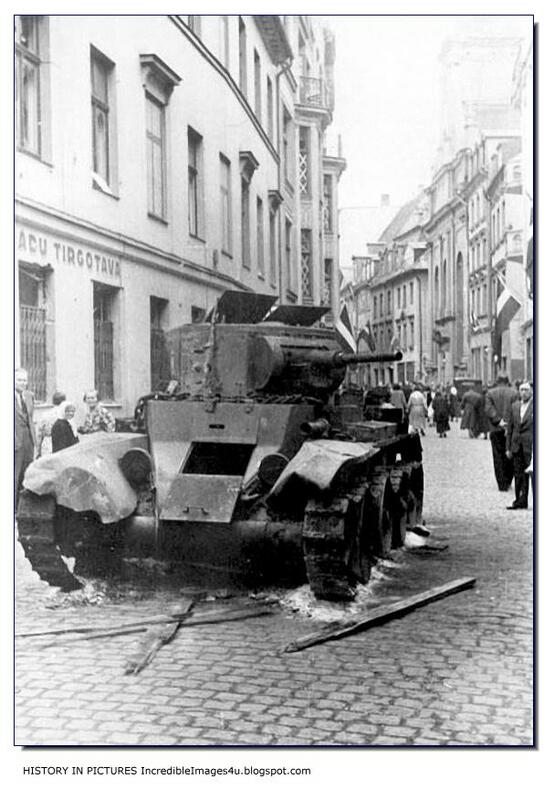 Only seven Red Army divisions opposed Army Group North as it swept down from Finland. Quickly the Baltic states fell, and the populations celebrated the German columns marching in, thinking they were their liberators. By July 1 Army Group North reached the Dvina River. Army Group Center moved around the north edge of the Pripet Marshes and encircled first Bialystok and then Minsk by the second week. 290,000 prisoners were taken in this operation. Army Group South was marching on Kiev despite heavy rains. 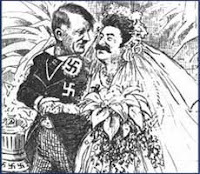 Stalin was paralyzed by Hitler's betrayal of the Nazi-soviet nonaggression Pact and by the destruction and did not react to the crisis in time. 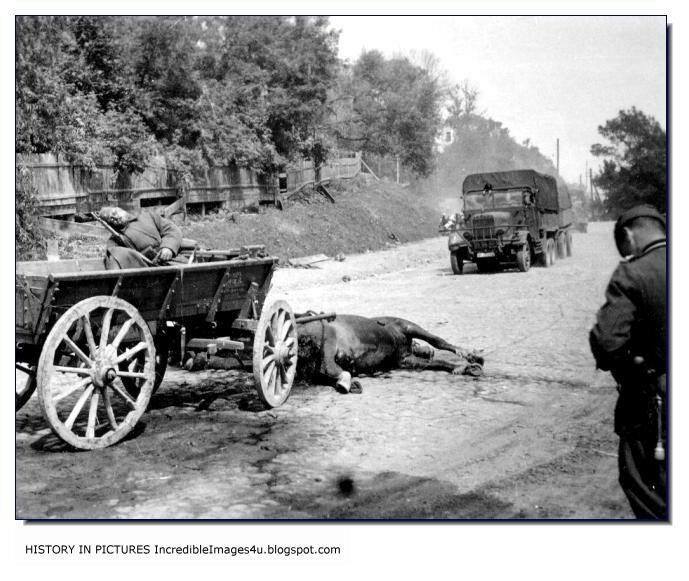 While he sat in Moscow paralyzed by the rapid advance, the Red Army was bleeding to death. 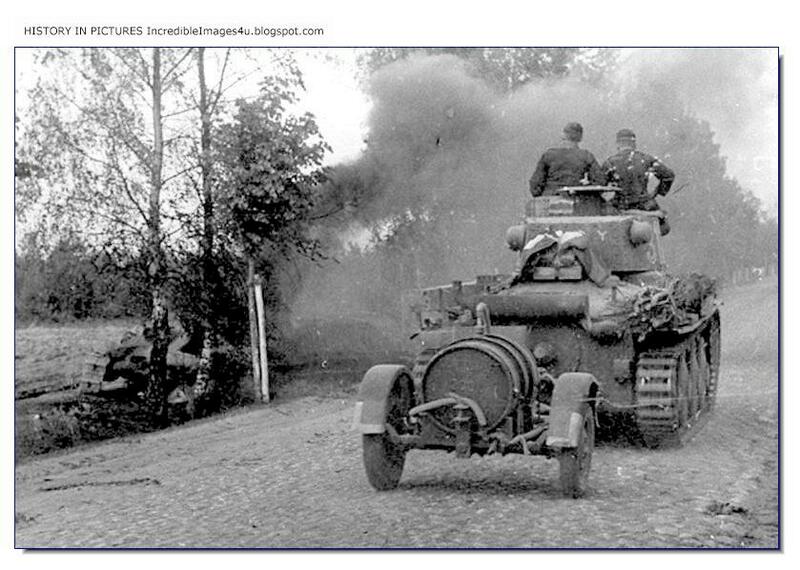 Across a huge front of 1400 miles, the Germans started advancing rapidly. The Red Army fought fiercely partly out of fear of being shot for cowardice and partly because they feared a German occupation. But many Soviet units were deployed badly and their commanders would not mount a mobile defense for fear of the firing squad. The Germans destroyed Russian units and rounded up large numbers of prisoners. OKH believed the Russians could not sustain this level of casualties. On July 3, Colonel General Franz Halder announced that the Germans would encounter only token resistance beyond the Dnieper and Dvina Rivers. Hitler concluded that the Russians had lost the war. As the Germans advanced as much as twenty miles a day, the Red Army slowly began to reorganize in the face of the enemy. On June 30, Stalin appointed himself the head of the State Defense Committee, and assumed all political, military and economic power in the country. On July 10, the Russians also split their forces into a three-group command structure, designated Northwest, West and Southwest Forces. These were nothing like the Germans’ Army Groups, since their officers lacked the expertise or authority to direct large-scale operations. Each border military district was converted into a “front” which was the largest effective command the Russians could coordinate. For the first time, the Russian people heard the voice of their leader. Stalin addressed the entire country on July 3. He welcomed aid from the West and proclaimed a scorched-earth policy, denying the Germans everything and calling for the Russians already under occupation to fight hard against the invaders. He also appealed not only to communist ideals but to Russian nationalism. Two perennial allies of the Soviet Union were beginning to be felt by both sides. Torrential rains turned the roads into quagmires, slowing the advance on Moscow. ’General Mud’ had slowed Napoleon in 1812, and it slowed the German advance in 1941. The second was the expansive Soviet territory. The great distance the Germans had to travel began to extend their supply lines over great distances. Partisans, first disorganized and cut off, then later with plainclothes officers of the Red Army, began to harass these supply lines. Without enough soldiers to protect the supply lines and fight the main engagement, the Germans used innovative means to protect trains and columns advancing to the front. Still, the guerillas were a constant threat. The Germans’ supply issues were becoming critical. Like the Americans in Belgium in 1944, the length of their supply lines meant that winter uniforms had to sacrificed for food, ammunition and fuel on the trains and supply wagons. The German Armies before Moscow were fighting in December 1941 with the same uniforms that they had in the summer. With only 40 miles between von Bock and the Soviet capital, the Germans had only a few days of good weather to complete their occupation of Moscow. The capital was in terror. Armed troops tried to keep order and prevent a mass evacuation until it was organized. Stalin himself left the city. But by December 5 Heinz Guderian, hero of France and commander of the panzer spearhead from the South, reported that his troops were exhausted and could not continue. The German general charged with taking Moscow, Colonel General Heinz Reinhardt, said he could only hold if the Russians did not attack. Stalin feared that the Japanese would attack his East flank if he withdrew his troops there to fight the Germans. The Siberian units were snow-equipped, battle-experienced, and ready for combat. But Stalin did not bring them over to the European front until Richard Sorge, the Soviet spy in Tokyo, revealed the Japanese plans to attack the Western powers in the south Pacific. The Germans were ruthless. 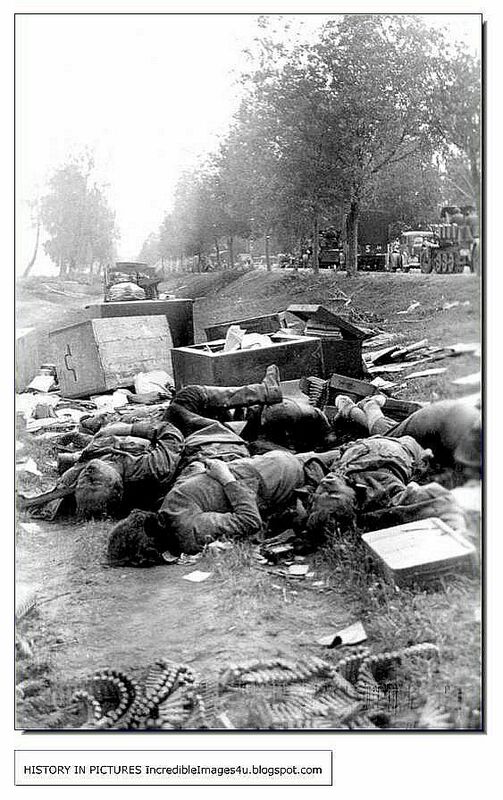 Russian civilians lie in a heap on the roadside, as the Germans march on. The Eastern Front was a no-rules war. It was a myth that all German soldiers were armed with advanced guns. 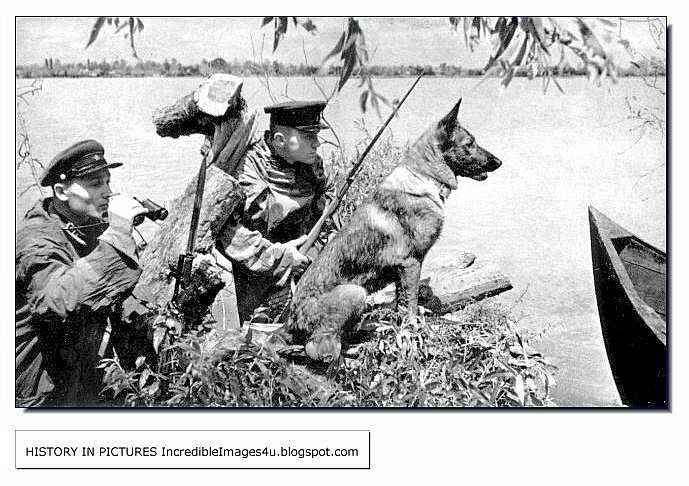 The men in the picture have mere rifles. Also the tank in the picture is a weak model considering the age.